Nemcsak ötszáz különböző jármű lesz egy helyen május 25-26-án a Nagyerdőn, de a cívisvárosban korábban még nem látott show-műsorokkal is várja a közönséget a Debrecen Drive. Új autók, motorok, katonai járművek, kamionok, rally- és sportkocsik, quadok, kerékpárok – felsorolni sem egyszerű, milyen komplex kínálattal készülnek a szervezők az első Debrecen Drive-ra, amely országosan is egyedülálló kétnapos járműipari seregszemle és látványos show-műsorokkal, koncertekkel színesített szórakoztató rendezvény. Szombaton és vasárnap is háromóránként garantáltan elakad a közönség lélegzete a mutatványoktól, amiket kaszkadőrök, driftesek, motorosok adnak elő a legváltozatosabb járművekkel a Drive Katlanban, ahol kiépített lelátókról nézhetjük a műsorokat. „Összesen tizenkét autóroncsot zúzunk, taposunk majd szét a két nap alatt a big footként is ismert monster truckokkal, amiket szakavatott kollégáink hajtanak végre. Garantáltan élvezni fogja a közönség, napi három taposóshow-t készítünk elő egy meghatározott koreográfia alapján, ami illeszkedik a driftesekből és kaszkadőrökből álló fellépő csapat több mint fél órás műsorblokkjába” – adott ízelítőt a programból Illés Péter, a Monstershow értékesítési menedzsere. Erdős Csaba kaszkadőr motorokkal, quadokkal, egykerekű biciklikkel érkezik csapatával Debrecenbe, de ezeken túl egy olyan terepjárót is hoz, amit egyedülálló módon rámpa nélkül fog két oldalsó kerékre állítani. Maximális biztonsági elővigyázatosság mellett a közönség legbátrabb tagjait pedig a járműveikre is invitálják. „A kaszkadőr munka, a filmezés és fellépések mind nagyon veszélyesek, nem szabad rutinból csinálni, még ha ezerszer bemutattam az adott trükköt, akkor is nagyon ott kell lenni fejben, a közönségre pedig kiemelten vigyázunk. Kívülről úgy néz ki, hogy könnyen végrehajtható mutatványok ezek, de senkinek ne jusson soha eszébe utánozni minket, mert nem fog menni” – mondja Erdős Csaba, aki elhozza Közép-Európa leggyorsabb földön közlekedő dragster autóját, egy kétezer lóerős versenyautót, amit a Debrecen Drive-on szintén megcsodálhat a közönség. Driftesek közül szintén az ország krémje látogat Debrecenbe, Radák János „Radír” a szakma legelismertebb képviselője, a motocross-freeride vonalat pedig egy nemzetközileg is elismert, fiatal magyar csapat fogja bemutatni. Residents: 208,000 persons. Population of working age (15-74 years) in Debrecen: 155,000 persons, in Debrecen and its vicinity: 730,000 persons. Companies settling in Debrecen and creating jobs may receive various benefits and support. Aid intensity is 50%, which is the highest rate available in the European Union. Debrecen can be easily accessed by motorway, railway and by air. The town is directly linked to the national motorway network - and through this the entire western European motorway network. 14 major cities are accessible by scheduled flights from Debrecen International Airport. The number of grammar school students is 15,900, while 7,800 students study at technical, electronics and IT schools. Well-functioning dual training: cooperation between vocational training institutions, the University and local companies. The number of people participating in vocational training: 13,000 persons. The University of Debrecen is the most significant higher education institution in the region, with almost 30,000 students enrolled at 14 faculties. In the first semester of the academic year 2017/2018, 4,794 students were enrolled in technical studies, and 6,013 persons graduated in the same field. If required, the University offers to provide the economic operators with training consisting of 7-8 courses - in accordance with their specific needs. The greatest parade of the automotive and vehicle industry in the east region. The past, present and future of the automotive industry displayed on over 20 thousand square meters. The greatest summer starter public event in Debrecen; several thousands of visitors are expected. Reliable background of the organizers, secure basis. Debreceni Campus N.K. Kft. is an event organizer company with the highest revenue in the region. The best-known one of its references is Campus Festival, but it also participates in organizing events for thousands or tens of thousands of visitors. In recent years the company also organized the Debrecen Car Display. DEBRECEN DRIVE - trade exhibitors: vehicle sector operators and representatives of the related fields (distributors of new commercial and passenger vehicles, financial service providers, insurance companies, parts manufacturers and suppliers, distributors of accessories, HR-Job Street. DEBRECEN DRIVE - additional attractions: special sports cars, old-timers, motor homes, street food vehicles, demolition derby and bigfoot cars, limousines, electric recreational vehicles, bicycle and motorcycle shows, and other special vehicles. 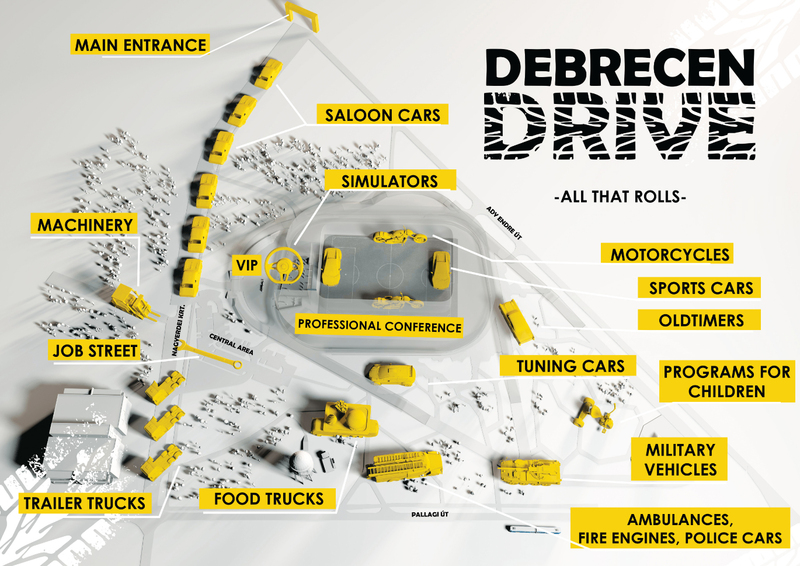 DEBRECEN DRIVE - competitions: car games of skill, wheel exchange competition, tire throwing competition, arm wrestling competition, forklift competition of skill, several programs for Children's Day. The date of the event is set to match seasonal needs. Unique sales opportunity, outstanding event for exhibition. Strong and wide marketing campaign. Meeting point for labor force and employers. Possibility to network with other exhibitors, prominent persons of the profession, or company executives. A party will also be organized for the exhibitors on the Saturday night of the event. Debrecen has enjoyed a few dynamic years both from economic and cultural aspect. Several multinational companies have decided to choose our town. New factories are being built, the infrastructure is developing, the summer cultural events attract hundreds of thousands of people, and the investment in the automotive industry actually rewrites the future of Debrecen. In May 2019 a gap-filler event will be added to the program portfolio of the town and the region that is unheard of around here. The basic concept of the Car Display was extended, and this is how the idea emerged to organize the event named Debrecen drive - All that rolls, presenting the operators of the vehicle industry and the entire transport sector at a scale larger than ever. The event, planned for a May weekend - when Children’s Day is - offers excellent free time activities for everyone. It is guaranteed by the unique location in the heart of the Great Forest and the wide range of programs. I am positive that this two-day event will activate the residents of the region, and the range of exhibitions will make Debrecen Drive an outstanding event on a national level. In addition, the promising high-quality professional programs may assist integrating researchers and companies operating in the region into a unified community, according to the phrase “We form Debrecen together”. The automotive industry has become a key economic sector, however, in addition to technological issues, more and more attention is paid to the environmental aspects of driving. The University of Debrecen - With its 40-thousand students and offering courses at 14 faculties and in 350 majors - is a dominant higher education institution of the country, offering degrees in most disciplines, and providing possibilities for research. Our institution supports the re-industrializing efforts of the government - started a few years ago - by re-structuring its education system. Our goal is to train outstanding engineers and inventors at our university, who will also excel in the automotive industry. Due to the technical training, research and the development, we have already developed intensive relationships with the large automotive companies new to Debrecen. I believe that due to the educational and R&D work at the university, the visitors of Debrecen Drive will be presented innovative technical solutions realized and patented by the creativity of engineers from Debrecen. This time our future is formed on drawing boards. We believe, and we work to achieve that in the future the technical and engineer training at our university becomes essential when it comes to the automotive industry. In addition to the renowned Travel Fair, our team organized the Car Display for the fourth time. In line with the economic growth the demands are also changing, so this event has overgrown its original framework. Our institution, as the organizer of large events in Debrecen (Campus Festival, Zamat Festival), maintains close connection with the town and the University of Debrecen, as well as with several companies operating in the area. As a result, we are aware of the challenges faced by the automotive industry. Debrecen Drive is an event equally suitable for the profession and the large audience, as well as for the young and the old, or for women and men. It addresses car lovers, non-professionals, enthusiasts of green solutions, old-timer lovers and those interested in the latest models. It is an event where not only passenger cars play the central role. Our goal is to show samples of almost all means of transport, such as bicycles and small electric vehicles, sport and tour bikes, power engines and machinery, as well as a wide scale of “spectacle” vehicles and vehicles used for public purposes. In addition to the exhibition, the visitors are welcome at various interactive programs, spectacular presentations, competitions and public or professional lectures. Managing Director. Debreceni Campus Nonprofit Közhasznú Kft. ©copyright 2018. Debreceni Campus Nonprofit Közhasznú Kft.